Hand lettering is all the ragers, isn’t it? I love, love, love to try my hand at it, but generally my lettering is on par with the Hulk’s ballroom dancing career. It just ain’t too purdy. Now, it’s not awwwwful, but it’s not perfect by any means. 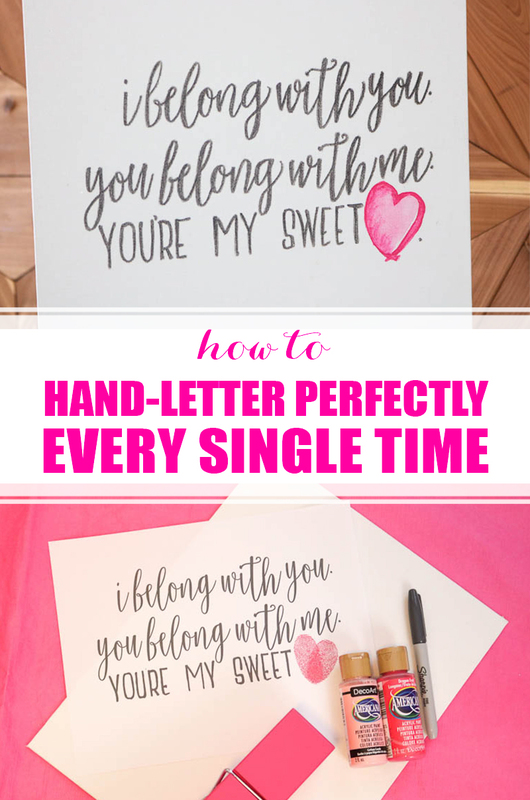 Hence my lazy girl approach that gives me pretty much perfect hand-lettering every time. I did have to come to terms with it in a way, but I’m ok with using this method as it really looks great, like real hand-lettering and it saves me a garbage-sized-truckload of time. Create your own template using Google Draw or Pages. Find fun, hand-written type fonts at Creative Market. Be sure to tape your template down over your graphite paper so it won’t move around. Lightly go over the graphite tracing with your sharpie and then go back to thicken your downstrokes. Use DecoArt Acrylic paint to shade your heart. Dip your brush in water to create a watercolor effect. If you’re Bold, try using some acrylic paint and a brush to letter! There is zero shame in tracing. You have my permission to use a template and just say “thank you” to anyone who says you have beautiful penmanship. Or just let them in on your secret because it’s just too amazing to keep to yourself!